Once we have sequenced genomes in the previous course, we would like to compare them to determine how species have evolved and what makes them different. In the first half of the course, we will compare two short biological sequences, such as genes (i.e., short sequences of DNA) or proteins. We will encounter a powerful algorithmic tool called dynamic programming that will help us determine the number of mutations that have separated the two genes/proteins. In the second half of the course, we will "zoom out" to compare entire genomes, where we see large scale mutations called genome rearrangements, seismic events that have heaved around large blocks of DNA over millions of years of evolution. Looking at the human and mouse genomes, we will ask ourselves: just as earthquakes are much more likely to occur along fault lines, are there locations in our genome that are "fragile" and more susceptible to be broken as part of genome rearrangements? We will see how combinatorial algorithms will help us answer this question. Finally, you will learn how to apply popular bioinformatics software tools to solve problems in sequence alignment, including BLAST. As in previous courses, each of these two chapters is accompanied by a Bioinformatics Cartoon created by talented artist Randall Christopher and serving as a chapter header in the Specialization's bestselling print companion. You can find the first chapter's cartoon at the bottom of this message. 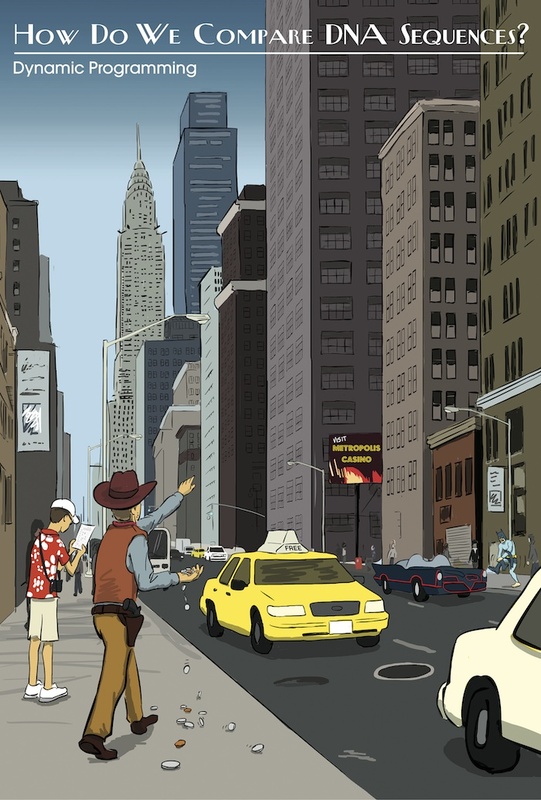 Why have taxis suddenly become free of charge in Manhattan? Where did Pavel get so much spare change? And how should you get dressed in the morning so that you aren't late to your job as a crime-stopping superhero? Answers to these questions, and many more, in this week's installment of the course. Welcome to Week 2 of the class! Last week, we saw how touring around Manhattan and making change in a Roman shop help us find a longest common subsequence of two DNA or protein strings. This week, we will study how to find a highest scoring alignment of two strings. We will see that regardless of the underlying assumptions that we make regarding how the strings should be aligned, we will be able to phrase our alignment problem as an instance of finding the longest path in a directed acyclic graph. Welcome to Week 3 of the class! Last week, we saw how a variety of different applications of sequence alignment can all be reduced to finding the longest path in a Manhattan-like graph. This week, we will conclude the current chapter by considering a few advanced topics in sequence alignment. For example, if we need to align long strings, our current algorithm will consume a huge amount of memory. Can we find a more memory-efficient approach? And what should we do when we move from aligning just two strings at a time to aligning many strings? Welcome to Week 4 of the class! You now know how to compare two DNA (or protein) strings. But what if we wanted to compare entire genomes? When we "zoom out" to the genome level, we find that substitutions, insertions, and deletions don't tell the whole story of evolution: we need to model more dramatic evolutionary events known as genome rearrangements, which wrench apart chromosomes and put them back together in a new order. A natural question to ask is whether there are "fragile regions" hidden in your genome where chromosome breakage has occurred more often over millions of years. This week, we will begin addressing this question by asking how we can compute the number of rearrangements on the evolutionary path connecting two species. You can find this week's Bioinformatics Cartoon from Randall Christopher at the bottom of this E-mail. 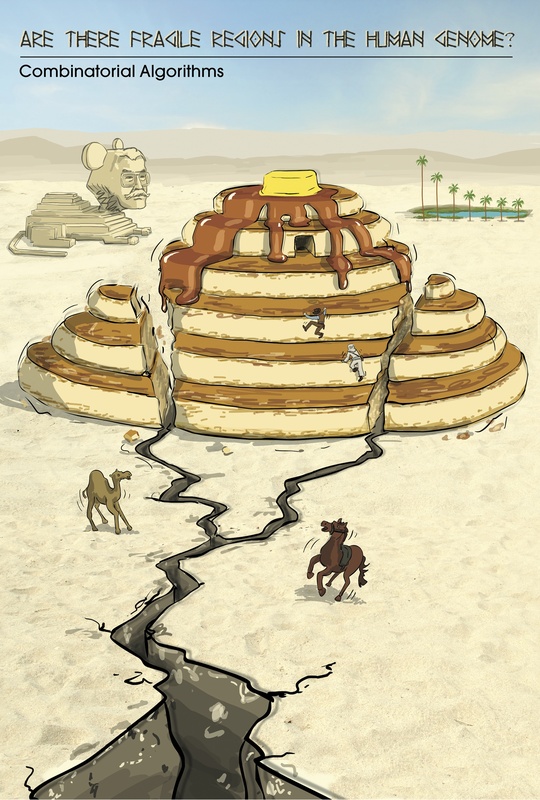 What do earthquakes and a stack of pancakes have to do with species evolution? Keep learning to find out! Last week, we asked whether there are fragile regions in the human genome. Then, we took a lengthy detour to see how to compute a distance between species genomes, a discussion that we will continue this week. It is probably unclear how computing the distance between two genomes can help us understand whether fragile regions exist. If so, please stay tuned -- we will see that the connection between these two concepts will yield a surprising conclusion to the class. In the sixth and final week of the course, we will apply sequence alignment algorithms to infer the non-ribosomal code. by Ericdo1810 completed this course, spending 12 hours a week on it and found the course difficulty to be very hard. This course is great, and beyond that. I have never seen any MOOC like this one. So challenging, so rigorous, and so satisfying upon completion (which I just did half an hour ago). You may be turned off by the word "Bio", if you're a CS person. However, what I can say is: you don't need biology in this course, literallly: zero biology knowledge. To me, all the genes and chromosomes and blah blah, they are just alphabets! The real deal, the real big deal in this course, is that learners will struggle, and struggle a lot, to learn, understand, and implement all the algorithms taught. Hence, if you're really into algorithms to better yourself. This course is really one of the great ones out there. Why do I rated this course Hard? Actually I wanted to rate Very Hard. That was what I felt. However I think because I'm a newbie, that's why it's very hard. I think for many people, this is Hard only. But why hard? This is the first MOOC ever I have to watch the video lectures multiple times, WITH PEN AND PENCILS to follow the ideas. The algorithms taught were extremely brilliant that sometimes my jaws dropped and I thought to myself: those people are so smart. Watching lectures in this course is like a cycle: Some Curiosity ---> Utter Confusion ---> Rewind ---> Revelation ---> Oh my GOSH they're so smart. Yes, watching the lectures, is very satisfying for me. Hence, I recommend, if you are not interested in the quizzes or code challenges, watching the lectures will whet your appetite for algorithms. About grading, this course is not a mickeymouse course with MCQs that you can blindly guess. Contrary to your expectation, this course has a small percentage for quizzes. The bulk of the work is the hands-on, practical assignments. To the people who are not confident in programming, there's a Biology application track, in which you can earn the normal certificate. However, for people who are in for the ultimate challenge of this course, there is the Hacker Track. This is where the course greatness shines. In total, this course has 20+ coding challenges in which you will implement the various algorithms taught in the course. Well, you don't have to know the biology, but you'll need lots of coding skills in this track. They are hard. All of them are graded by submission of data output. Hence, your algorithm needs to produce exactly the same output as the grader, matching in both values and format. Of course, if you can match the value, matching format is kinda a trivial nuisance. I gotta say the implementation of the algorithms has been extremely satisfying, especially for a person who is interested in doing data crunching and all, the algorithms taught were extremely relevant. They are hard, expect about 2+ hours on each coding challenge, and 40+ hours overall. However, if you're an algorithm god, maybe you'll do much faster than that. That said, I derive the pleasure from overcoming the challenges. Hence, the course is great, just by its virtue of being tough, alone. Having overcomed those code challenges, I still feel a great need to consolidate them. This series is a gem on Coursera. The entire series, not just this (because I just completed part V also). This may not be suitable to many people, so please save yourself the frustration if you're not patient wrestling with complex concepts. However, if you're an algorithm enthusiast, you may find this course a very worthwhile learning journey. The taste of overcoming huge challenges is great. "I agree, these are really high quality courses. I cannot imagine how much time they spent making this stuff. This is in a completely different league than other stuff I've taken on Coursera (data science). I would highly recommend you to do and finish part IV on Molecular Evolution (I finished it this run). It may not seem like that in the beginning, but about half way through beginning with "Evolutionary trees fights crime" and going into the "Was T.Rex just a big chicken" the course has some amazing stories. I found it by far the most interesting part of the entire series, but it is also quite challenging. "